To show you how to created a character in Blender that can be successfully exported to UE4. Then open this in Blender. You will be presented with the default mannequin model. 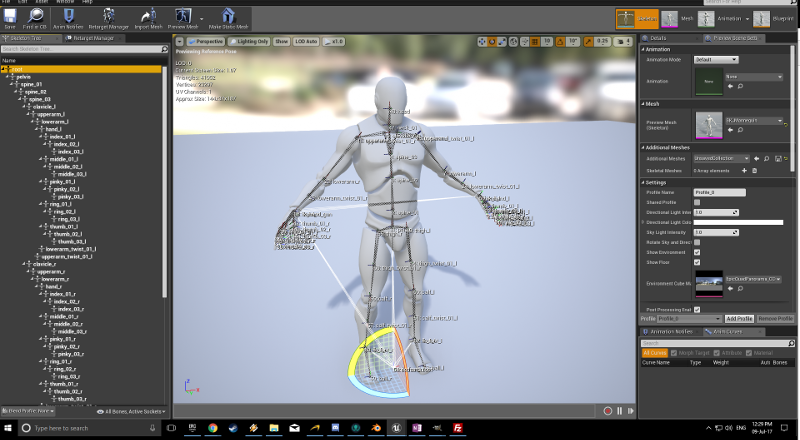 This is very similar to the mesh and skeleton from the UE4 default Mannequin. You can see the UE4 bone structure in the default skeleton hierarchy on the left of the above screen shot taken from UE4. This will include making sure the character is skinned and rigged for exporting. 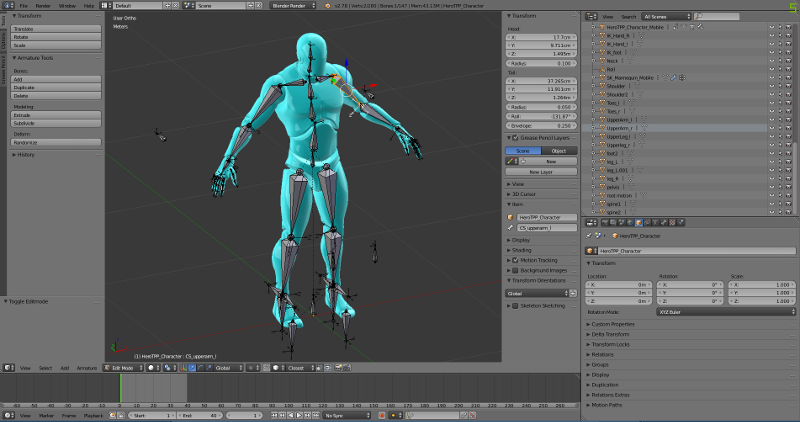 The Default Mannequin .blend file includes all of the armatures (bones) for inclusion in the character. This skeleton is the default UE4 skeleton. Where possible it is best to use this skeleton (names and hierarchy) to make animation retargeting easier. 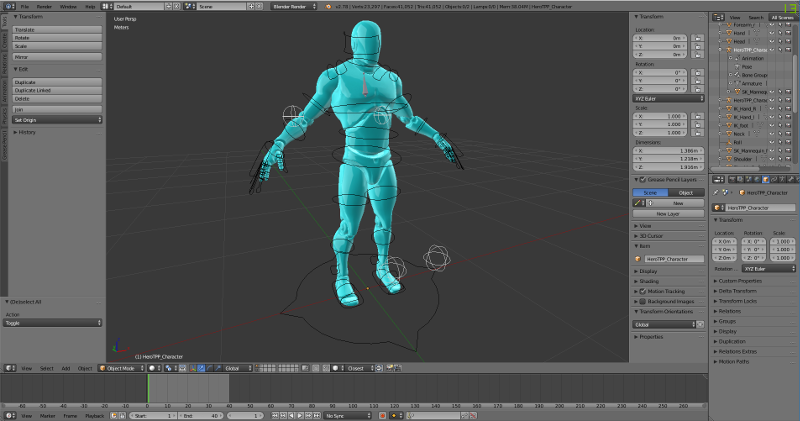 The way Blender will associate vertices of a mesh with a particular bone (armature) is via the use of vertex groups. 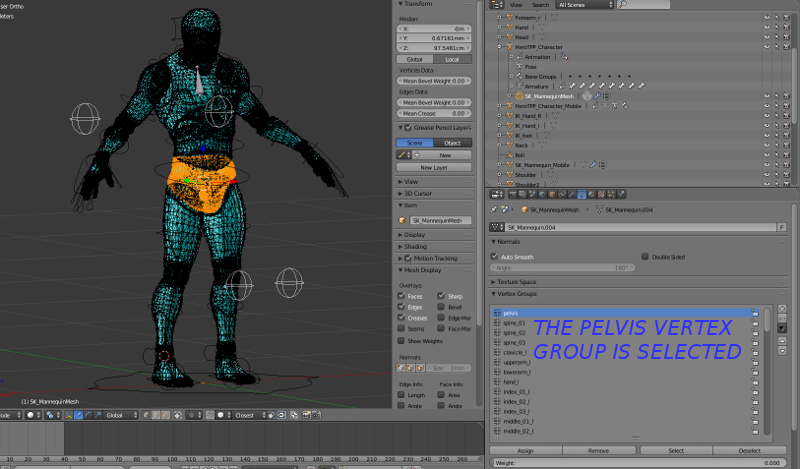 In the image below the vertex group labelled "pelvis" is selected. This demonstrates which vertices are controlled by the pelvis armature. This step requires use of the UE4 tools to retarget the animation from another source to the Blender character. One important note when retargeting is to not retarget upperarm_twist_l, upperarm_twist_r or lowerarm_twist_l or lowerarm_twist_r. Leave these unmapped against the humanoid rig for best results.